There's some good news for those who like their privacy when browsing, because the full version of Opera now comes with a built-in free VPN service (which first became available in the developer version of the browser back in April). Opera's integrated VPN is 'no-log', meaning that your surfing activities are not logged in any form, and it offers 256-bit AES encryption to keep your communications secure. You get the choice of five virtual locations from across the globe, which is increased from the selection of three as seen when the VPN was first pushed out in preview. Said locations are: Canada, US, Germany, the Netherlands and Singapore. That means you can appear to be from any of those locations to potentially get around region restrictions applied to online content, which is what a lot of folks use a VPN for, as well as staying secure when surfing. 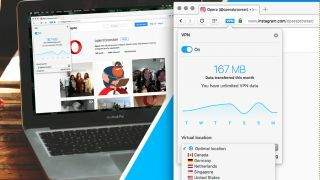 And it's obviously convenient to have the VPN built-in rather than having to look for a third-party service – plus Opera has designed its offering to be simple to use. Once turned on (you'll find the switch for that in the browser's Settings – or Preferences on a Mac – and then look under Privacy & Security), the VPN can be left to intelligently select the best server location on its own, so no thought is required from the user. Krystian Kolondra, SVP of Opera browser for computers, commented: "If people knew how the internet truly works, I believe they all would use a VPN. By making our browser VPN free and easy to use, we hope to make it an essential tool, just as the lock and key is to your house." We contacted Opera to check if there were any restrictions on this VPN service in terms of transfer limits, and the company clarified that there were none. In terms of revenue, a spokesperson for Opera also noted that there are no plans to make money off the back of the VPN offering right now – the main goal is simply to differentiate the browser from others and make it more appealing. Last month, Opera launched a new free VPN app for Android, following up on its previously released iOS offering.